In New Hampshire this Tuesday, as in the previous debates, Romney and Perry had far more time to speak during the debate than the other candidates. This has been the true at least for the Orlando, Tampa, and Reagan Library debates. However, the gap between first and second place was the largest in this debate, with Romney having over 4.5 more minutes to speak than Perry. Since I've been studying the allocation of speaking time at the GOP debates, I've seen Cain rise from last place (at the Reagan Library and Tampa) to third place in New Hampshire. Ron Paul, on the other hand, has had progressively less and less time to speak, placing fourth place, sixth place, eighth place (second-to-last) and eighth place (last) from the debates from September 7 until October 11. The time given to the remaining candidates has fluctuated from debate to debate. My favorite quote from the debate was from Michele Bachmann: "Let's not give Barack Obama another $2.4 trillion blank check to spend." I understand the point she is trying to make, but the troll inside me just can't help but to point out that a check for a specific amount ($2.4 trillion) made out to a specific person (Barack Obama) can not technically be a blank check. 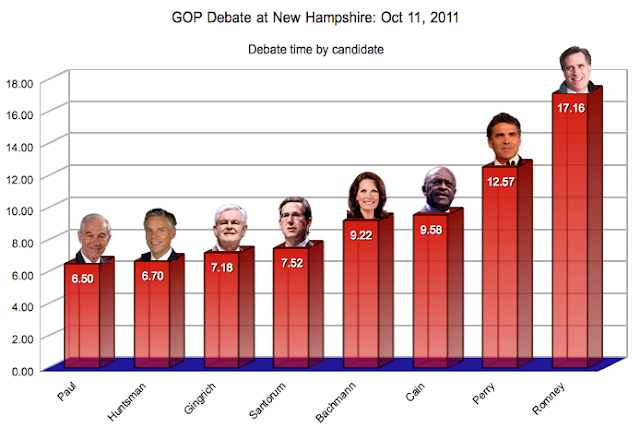 Following are the speaking times I measured for each of the candidates at the New Hampshire debate. I used the same approach as the previous debates: For a given question asked to a candidate, I did not include the time of the initial question asked by the host. I included the time the candidate took to answer, as well as any dialogue between the candidate and the host during the answer. My notes from the debate, upon which my time measurements are based. As usual I invite any readers to point out any inaccuracies in my notes. Tarp, How will 999 restrict freedom? Closing statements: How do you relate to the American people ?